Someone emailed me about how well the XT10i fares for astrophotography, and I thought our email conversation might be useful to other people considering the XT10. Hi James, I am currently looking into re-starting my astro hobby (I used to have a - self built 15cm F/5 newton) and while binoculars are nice, I am looking into something bigger. So, I bumped into your site after searching for more info about the XT10i. I’m very tempted by it. But there’s a big but here.. I am also a photographer, and “dobsons are useless for astrophotography”, as everyone says. Now, your site is the first where I see a mention of astrophotography combined with a dobson.. unfortunately no samples.. have you tried anything yet? I’m very curious which subjects are doable.. I understand deepsky long exposures will be tricky/impossible, but personally I think planets/moon should at least be possible? > > Anyway, you’re now in my bookmarks.. well, your site is, keep up the good work. The XT8 / XT10i certainly seems to be a favourite amongst people looking at getting a new telescope. That certainly was the impression I got while researching before buying mine. And making the decision was very tough, but based upon getting the best light-gathering scope I could for the money, plus the computerisation of the Intelliscope. I am just about to start work on the XT10i Astrophotography section of the site. My initial attempts are very basic. The Moon, Mars and Saturn. Unfortunately the English weather this year has been so terrible since I got the scope that I have had very few opportunities to try out my webcam, and so my pics so far have been afocal using both my little Pentax Optio L30, and my JVC GR-DX300EK video camera, although some of the results have been not too bad. The technique I have been using has been to align the scope on the object on one edge of the field of view, then leave the scope static, and start capturing the video to get about 30- 40 seconds worth of movement of the object as it passes from one edge to the other. Repeat again for additional passes. Then later pass the video clip through Registax or K3CCDTools to enhance the image. This does work ok, but requires a bit of patience and a few attempts to get a sequence that is suitable, and then a fair bit of fiddling in Registax/K3CCD because of course its a moving target which has to be aligned. It certainly gets you familiar with the software side of things. When I purchased the XT10i, my attitude was that I would buy the scope on its plus points, e.g. high quality optics, Intelliscope, large aperture, and that I am an amateur and should probably learn the sky, star hopping, and basic photo tehcniques first. But that the XT10i would be a suitable OTA to put onto a sturdy EQ mount (buy just an HEQ5 or HEQ6 Goto mount) at a later date. webcams can provide), paracorr correction lenses to give crisp detail over a wide view, and expensive filters to help reduce light pollution. So for the time being I think I am ok with the XT10. The only thing about Dobs is the rotational Teflon azimuth bearings issue (stiction), which is quite honestly a very frustrating problem! Yes you have the immediacy of the dob, but sometimes I wish for the precision of a proper mount. These are all things you have to weigh up, and while we boys would like all our toys to be perfect right from the start, we have to exercise patience and learning to gain experience. Many people start with a dob, but get a second (or more!) scope(s) when they can afford it. I noted also from reading other peoples thoughts, was that those who own multiple scopes will often continue to use their Dob the most, due to the extra time and effort involved with setting up an EQ mount. tracking base- board to sit the whole scope and dob mount on top of, or the StellarCAT system http://www.servocat.com/index.html or else go for a scope on a Goto EQ mount like the C6-SGT. Think about this also: You’re wanting to do astrophotography. While greater aperture of the XT10 means better light gathering of DSO’s, what’s the point of having that aperture if all you can photograph is 40 seconds worth of smudge?, if you’re lucky! At least with a decent Goto mount you can train the scope accurately on an object and take good long exposures (eg 1 minute to 1 hour), and perhaps get something meaningful from dimmer objects. You will need either a DSLR camera capable of long exposures, or a modified webcam. Another thought: While attempting my astro shots I must waste as much time trying to align the scope, get it ready then focus and prepare the camera for the shot, all the while running out of those precious 30 seconds as the planet marches across the field of view! At least with tracking you can take your time and make more careful preparations. Anyway I will finish off by attaching a couple of my “better” photos, but bear in mind these are my best efforts at a very early stage in my hobby, and I still have a lot to learn about the various stages, and no doubt some improvement can be made. Taking video of the moon using my static scope method is very satisfying, watching it glide past as if you’re looking out of the space shuttle. 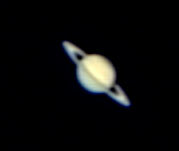 Did you see a couple of my better Moon shots and best Saturn webcam pic to date on this page…? It describes how I took the shots. I have not had opportunity to take Jupiter yet, but I think it could be promising. This entry was posted on Sunday, June 8th, 2008 at 12:09 am	and is filed under Astrophotography. You can follow any responses to this entry through the RSS 2.0 feed. You can leave a response, or trackback from your own site. Spam protection: Sum of four + five ? EQMOD + PCDIRECT or EQDIRECT. Which cable for Synscan EQ5 mount? Jims Orion XT10 Astronomy Blog © 2019 All Rights Reserved.